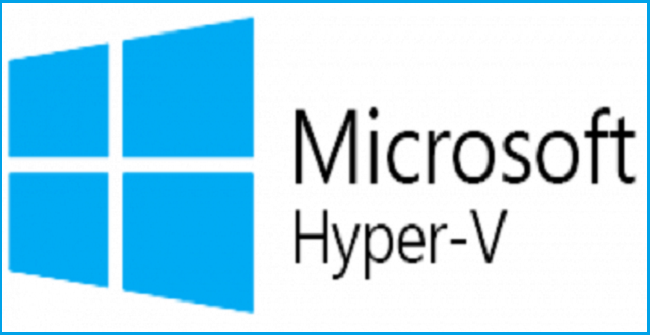 When you use the built-in Hyper-V tools (Hyper-V Manager and PowerShell) to delete a virtual machine, all of its virtual hard disks are still exist. This is by design and is logically sound. This guide will walk you through the steps to delete a virtual hard disk from a cluster shared volume that can not be deleted. There are a few ways that this problem may occur. All of these conditions will be applicable, but the way that you encounter them is different. When using Windows Explorer to try to delete the file from the node that own the CSV, you receive the error: The action can’t be completed because the file is open in System. Close the file and try again. Note: this message does sometimes appear on non-owner nodes. 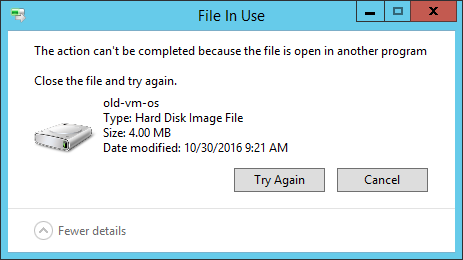 When using Windows Explorer to try to delete the file from a node other than the CSV’s owner, you receive the error: The action can’t be completed because the file is open in another program. Close the file and try again. Note: non-owning nodes do sometimes receive the “System” message from symptom 1. The error is always the same from PowerShell whether you are on the owning node or not: Cannot remove item virtualharddisk.vhdx: The process cannot access the file ‘virtualharddisk.vhdx’ because it is being used by another process. The error message from a standard command prompt is almost identical to the message that you receive in PowerShell: The process cannot access the file because it is being used by another process. Here we have a solution to fix it. Clean up is very simple, but it comes with a serious warning: I do not know what would happen if you ran this against a VHD that was truly in use by a live virtual machine, but you should expect the outcome to be very bad. Once the cmdlet returns, you should be able to delete the file without any further problems. Make sure to use Failover Cluster Manager to remove any other mention of the virtual machine. Look on the Roles node. These resources are not automatically cleaned up when the virtual machine is deleted. Try to be in the habit of removing cluster resources before deleting the related virtual machine, if possible. I assume that for most of us, deleting a virtual machine is a rare enough occurrence that it’s easy to overlook things like this. I do know that the problem can occur even if the objects are deleted in the “proper” order, so this is not the root cause. The above solution has worked for me every time, but it’s a very rare event without a known cause, so it’s impossible for me to test every possibility. There are two other things that you can try. Moving the CSV to another node might break the lock from the owning node. This has worked for me occasionally, but not as reliably as the primary method described above. In Failover Cluster Manager, right-click the CSV, expand Move, then click one of the two options. Best Possible Node will choose where to place the CSV for you; Select Node will give you a dialog for you to choose the target. The “nuclear” option is to reboot each node in the cluster, starting with the original owner node. If this does not work, then the disk image is truly in use somewhere and you need to determine where.